The Victorian government allocated $61.7 million over four years to implement Koolin Balit: Strategic Directions for Aboriginal health ('the Koolin Balit investment'). A key element of the investment was an evaluation plan that highlighted accountability to government, the Aboriginal community and the wider public and effectiveness of existing programs and future funding decisions. A program of focussed evaluation activities was pursued and it included the work of the Grampians Region Aboriginal Eye Health Advisory Group (GRAEHAG) that drives planning, implementation, data sharing and evaluation to improve eye health outcomes. This collective work resulted in a number of outstanding successes including a five-fold increase in eye examinations and optometry visits, additional eye care equipment and associated training and locally tailored health promotion resources, developed with strong local community engagement. These changes supported an increase of over 55 per cent of patients receiving annual diabetic eye checks from 2013 to 2016. This initiative is an example of how a collaborative approach to addressing local community needs can be achieved without the need to conduct a formal evaluation. Instead, the strategic use of data, program monitoring and community feedback provides a systematic approach to identifying local community needs and providing culturally appropriate responses. 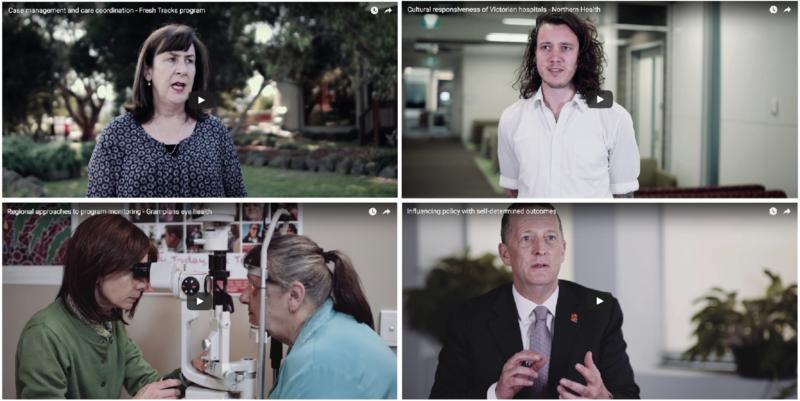 Digital stories have been developed to support these shared learnings from local level evaluations, reflective practices and continuous quality improvement processes employed in Aboriginal health and Koolin Balit initiatives across Victoria.